NeighborSpace is a nonprofit organization whose mission is to acquire and support the community based management of small parks, gardens, natural areas, river edges, and scenic landscapes in the City of Chicago for preservation, conservation, and educational public open space purposes. NeighborSpace primarily focuses on those parcels where community groups have established gardens or parks. These groups apply to NeighborSpace so the site can be owned by a nonprofit that has a mission to preserve and protect the sites. NeighborSpace continues to work in partnership with the three founding governmental agencies the City of Chicago, Chicago Park District, the Forest Preserve District of Cook County, as well as other nonprofit organizations and local community groups. To view or use these shapefiles, compression software and special GIS software, such as ESRI ArcGIS, is required. To download, right-click the "Download" link above and choose "Save link as." To view or use these shapefiles, compression software and special GIS software, such as ESRI ArcGIS, is required. Malls & Plazas sites are City-owned properties maintained by the Chicago Department of Transportation for public open space. To view or use these shapefiles, compression software and special GIS software, such as ESRI ArcGIS, is required. To download, right-click the "Download" link above and choose "Save link as." The Campus Parks Program addresses the shortage of parkland in Chicago's neighborhoods by targeting public school grounds for parkland improvements. 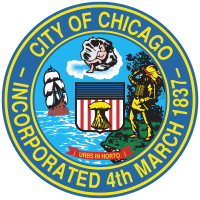 Under a joint program funded by the City, Chicago Public Schools and the Chicago Park District, existing asphalt and concrete paving are replaced with new landscaping, play equipment, trees, fencing and lighting. Priority is given to neighborhoods identified as having insufficient parkland, Strategic Neighborhood Action Program districts, Empowerment Zones, Enterprise Communities and other special development districts. To view or use these files, compression software and special GIS software, such as ESRI ArcGIS, is required. To download, right-click the "Download" link above and choose "Save link as." In 2009, CDOT opened the first sections of the river-level walkway from Michigan Avenue to State Street. The walkway winds under the Michigan and Wabash bridges, providing an uninterrupted route along the river from State Street to the lakefront. The walkway was built out 17-20 feet into the river to create a new shoreline. Future plans call for extending the Riverwalk to Franklin. CDOT built the basic infrastructure for the Riverwalk as part of the Wacker Drive reconstruction of 2001-02. From spring to fall, the Riverwalk is home to several restaurants and retail spaces. To view or use these shapefiles, compression software and special GIS software, such as ESRI ArcGIS, is required. To download, right-click the "Download" link above and choose "Save link as." Habitat Sites are natural areas that support wildlilfe on both public and privately owned land. Approximately 3,800 of the 146,240 acres within the city limits serve as habitat sites. Among the 97 individual habitat sites identified in 2004 using mapping tools, aerial imagery, site-visits, and previous inventory studies, most are located along the Chicago River and on the shorelines of Lake Michigan and Lake Calumet natural areas that support wildlife. To view or use this file, special GIS software such as Google Earth is required. To download, right-click the "Download" link above and choose "Save link as." Many of Chicago's largest parks are connected by a network historic boulevards. These wide, tree-studded avenues, along with the parks they connect, form an “Emerald Necklace” of green space around the city. To view or use this file, special GIS software such as Google Earth is required. To download, right-click the "Download" link above and choose "Save link as."